"Sundown" certainly did not lack for action (or body count.) Sayid and Dogen fought in Dogen's office, Smokey had some issues with the temple Others, Sayid settled some differences with Dogen and Lennon, while Ilana, Ben, Sun and Lapidus made it to the temple to save Miles from Smokey. Now that I've ripped all of my CD's into compressed digital formats in iTunes, I've acquired a turntable and started listening to more music on vinyl. As a listener, it's nice to have a more active and physical connection with music. Hard disk-based libraries are wonderful for depth and variety, but for listening to the great albums that you love as albums, the album-centric listening experience is rewarding and engaging. Instead of building a multi-hour playlist of digital music spanning dozens of genres, artists and albums across hundreds of songs, an LP listener has to flip after each side and can't easily skip ahead from song to song. The medium forces more engaged listening. But the LP is also an inferior medium to the CD and even compressed digital formats. The CD has tremendously more dynamic range. Dynamic range is the amount of sounds that can be reproduced from a recording-- from the lowest note and softest volume to the highest frequency and loudest volume. But today's recordings are mixed and mastered to push the average levels as high as possible, using less dynamic range than the CD medium is able to deliver. Robert Levine published the definite take on the so-called loudness wars in a 2007 article in Rolling Stone, The Death of High Fidelity, "Over the past decade and a half, a revolution in recording technology has changed the way albums are produced, mixed and mastered — almost always for the worse." Pete Bilderback, Yo! Turn It Down! "Dynamic range compression is not new. Producers of popular music have been using it for decades, and--used in moderation--it is actually an essential tool in producing good sounding pop and rock recordings. But over the past several decades producers, mastering engineers and recording artists have engaged in a race to create the loudest possible sounding CDs (the so-called "loudness wars") and in doing so have severely restricted the dynamic range heard in today's popular music recordings." Most modern music is seemingly optimized for listening in a 128 kbps MP3. Below about 192 kbps, MP3 files sound washed out, but above that are close enough to CD to be intistinguishable, except perhaps on truly audiophile equipment. Music recorded earlier than the mid-1980s was not only mixed, mastered and produced to fit within the limits of the medium, but also recorded to sound best on the medium. While 2" analog tape has a much wider dynamic range than an LP, did any artists not seek to make the best sounding LP possible? Bob Speer, What Happened To Dynamic Range? "What happened to dynamic range? That's a question that should be asked of record labels, producers, artists, and last but not least, recording and mastering engineers. The question needs to be asked because we're the ones responsible for what's happened to our music. Much of the music we listen to today is nothing more than distortion with a beat. Great music is suffering because it lacks dynamic range. When music lacks dynamic range, it lacks punch, emotion, and clarity." Comparing the waverforms for the CD and LP versions of Bob Dylan's Eyolf Østrem looked at the amount of dynamic range used by the different masters of the same album and concluded, Someone Please Fire Jack Frost. Even though the CD is capable of delivering a more dynamic representation of the music, it's often end up delivering as loud of a delivery as possible with less dynamic range. Given that digital formats are using less dynamic range than LP's, and that analog distortion is warmer, more musical and more natural than digital clipping, the vinyl record is remaining relevant, because the inferior medium is used in a superior manner. The loudness wars are making modern digital recordings sound worse than records. Which is a shame, because properly recorded and mastered digital recordings are more dynamic. The deepest lows and highest highs that a CD can reproduce are higher and lower than those on vinyl, but for albums that don't use all of that dynamic range, the warm sound and focused experience of listening to albums is more compelling for music fans. Chuck is a fundamentally silly show. Its version of international espionage involves many more "missions," "secrets" and "being a spy" in 44 minutes than actual undercover operatives might use in their entire careers. But as the closest spiritual successor to Buffy the Vampire Slayer, it uses spy movie tropes to set the stage for stories that are allegorical. Buffy brought vampires, monsters and hellmouths to high school; Chuck brings James Bond to mid-20's malaise. One of the things that the show fixed from its first to second seasons was the character of Morgan. Josh Gomez dialed his performance down closer to human. Unfortunately, Morgan largely reverts to some of the overbearing nerd. Perhaps this was a conscious choice by first-time director Zachary Levi, or perhaps this was the character just freaking out when he learns that the Buy More is a cover for a joint CIA-NSA task force. Although Office Space alumnus Diedrich Bader plays a twisted version of The Bobs and gives Chuck and Morgan a chance to have their biggest bromantic moment of the third season, it also plays against Jeffster performing CCR's "Fortunate Son," hand to hand combat and a Buy Moria take Iwo Jima. How I Met Your Mother, "Of Course"
The second act of "Of Course" may have been this show's single best act of the entire series. Realizing that breaking up Barney and Robin couldn't just be a return to the status quo, HIMYM finally realized that the relationship did have an effect on the characters and that they couldn't just go back to hanging out at McLaren's together without consequences. Fully integrated the heart and the funny. The emotional beats were cut properly with laughs, like Marshall's song getting more involved each time we revisit it. And how can you not like an episode where Marshall punches the head off of a Stormtrooper and adds, "frankly, I'm still angry at the Empire"
What do you call Russian Roulette played with dynamite? What would Lost be without Michael Emerson? The man has a talent to deliver any line with a creepy smarminess (See him in a 1992 prison guard training video), but also for conveying deep and genuine emotion. Benjamin Linus killed his father and let his adopted daughter be killed in service of Jacob and the Island. And what for? Why did he make those sacrifices? "I hope you've got some sleeping bags and tents. This might be a really long show tonight," says David Bowie from the stage a couple songs into his newly released live disc A Reality Tour. This turns out to be accurate as the show doesn't conclude for almost thirty more songs encompasing two discs. Pulled from a pair of shows recorded in Dublin back in 2003, there's little to hint that this turned out to be an ill-fated tour (it was cut short due to Bowie's health issues, and one show was cancelled after the death of a lighting tech). Bowie sounds energized and in good voice, has a top session band behind him and an energetic crowd (mixed high). Overall, the disc does well in conveying the feeling of being there. To his credit, Bowie picks songs from throughout his catalog, with about half the selections coming from his prime Seventies albums and the rest mostly from his post-Eighties work. In fact, only a few Eighties songs sneak in, and the most well-known only as a bonus track ("China Girl"). The highlights still come with the older material, including a great duet with bassist/vocalist Gail Ann Dorsey on Under Pressure (she kills on the Freddy Mercury vocal), the slow-building, anthemic Heroes and the suberbly sung Fantastic Voyage. Hang Onto Yourself comes late in the set as part of a trio of Ziggy Stardust songs and is the only really rocking moment of the show. The rise in energy (and beats per minute) produce the best crowd reaction of the night. Which is not to say that the discs aren't a good listen. Bowie didn't have much to prove on this tour, and really just needed to give a good show, which he does with good cheer and occassionally excellent performances from him and the band. In the end, A Reality Tour is a meant more for his fans than as a way to convert non-believers, and as a token of the tour, it does an admirable job. 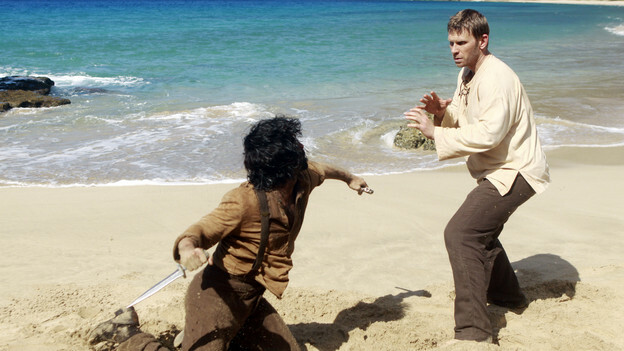 How much a particular episode of Lost is enjoyable depends more than anything else, on who is the featured character. If it's a Locke episode or a Ben episode, it's likely to be good. If it's a Jack episode or a Kate episode, I would lower my expectations -- but not expect all of their feature episodes to be subpar. Matthew Fox is very good when he's working with Terry O'Quinn, but Jack is less likely to be effective paired with other characters. (However, the Richard-Jack scene in last week's "Dr. Linus" was wonderful.) 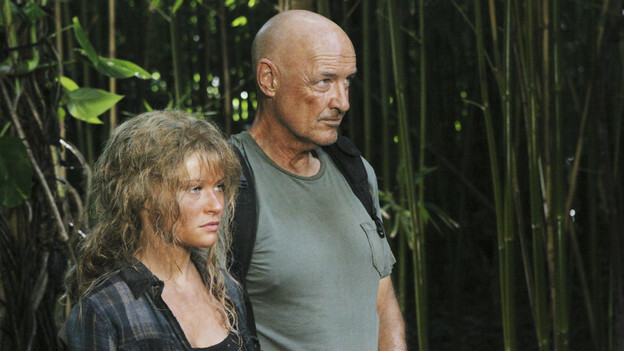 Actually, pretty much every actor on Lost gives a good performance when paired with O'Quinn. He tends to bring out the best in his fellow actors. So the fact that O'Quinn's Smokey the Locke is at the center of this season is good. Is this the first episode of Lost not to spend any time in any plot thread on the Island and just be largely an extended flashback, albeit a flashback on the Island? This page contains all entries posted to Buzz Rant & Rave in March 2010. They are listed from oldest to newest.